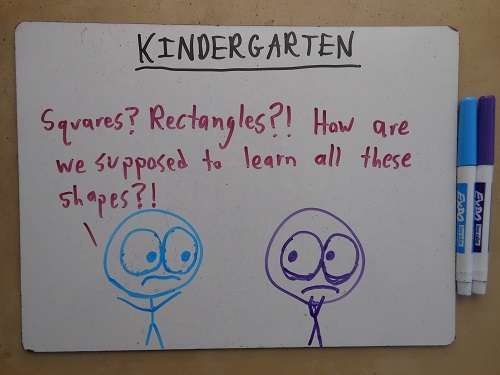 Math is always hard… until it isn’t. 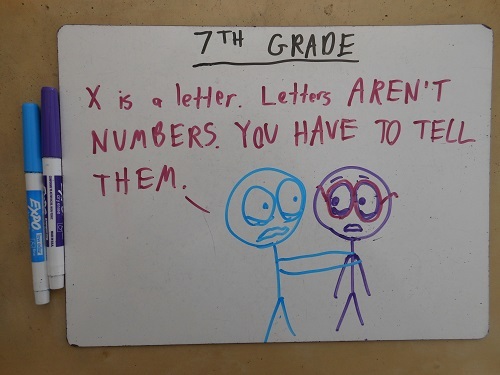 Learning new math is always scary. It may feel opaque, frustrating, contextless—the playing field is changing beneath your feet, and you’re not sure you know the rules anymore. But you’ve been here before. Look back to something you can now do without thinking—chances are that at one point, you didn’t find it quite so easy. Math can go from “impossible” to “obvious” much faster than you think. What now seems inscrutable will one day be quite scrutable indeed. Have faith, struggling students: It’ll All Make Sense Someday. Funny, I just wrote something about math class and faith. I’m the Fox Mulder of math class: I want to believe. But I’ve lost my faith. Now I’m just trying to show I really, really tried hard enough. 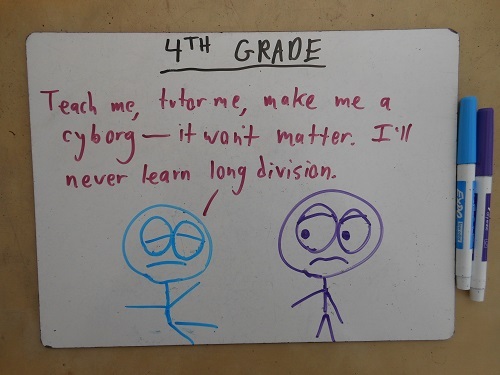 I’ll either prove a flaw in the “anyone can learn math” theory … or I’ll learn math. Win-win. Serious effort at a serious task is always worthwhile, no matter what grade results. Well, good luck! Coming back to math can feel particularly slow, but have faith! If you can finagle some in-person help (even over Skype, perhaps with a classmate) I imagine that’d be useful. Lots of MOOCs try to set up peer assistance (since assistance from instructors isn’t often feasible in such a large class). 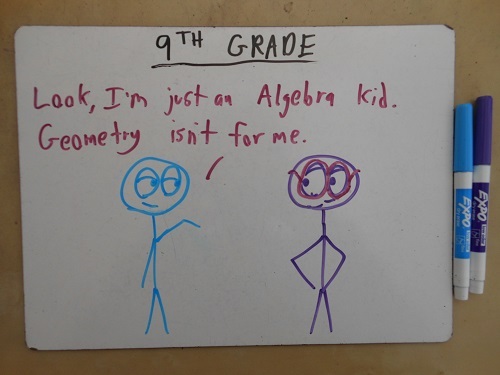 Hated math all through school. I understood the basics, but had trouble making them work right. Couldn’t remember the steps, everything had this stupid recipe. And in school, we’d learn something one year then next year it seemed we were learning something completely new and different; teachers expected you remembered what you’d learned the year before–cha right. 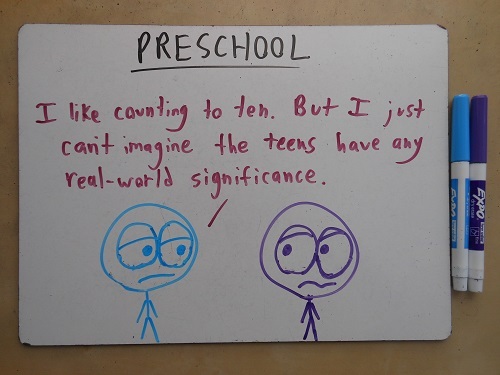 Then I graduated, and never did anything beyond basic change-making math again until fifteen years later in college. 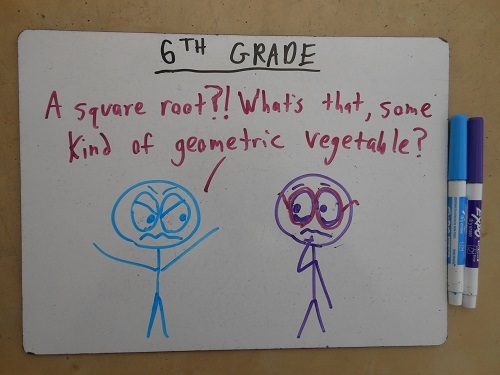 It was horticulture math with basic skills and geometry, but for some reason learning it was easier. It just suddenly made sense, as if I’d been watching it subconsciously in my everyday life and absorbing it. Four years after graduating I enrolled again for another degree. 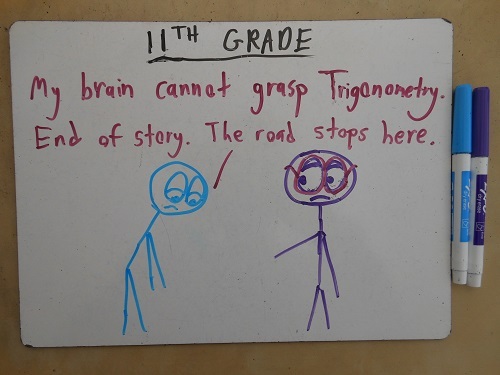 This time they forced me into advanced algebra and although the slopes and linear equations were familiar from before, I still did sh*tty. But at 39, I finally figured out why–I just didn’t care. 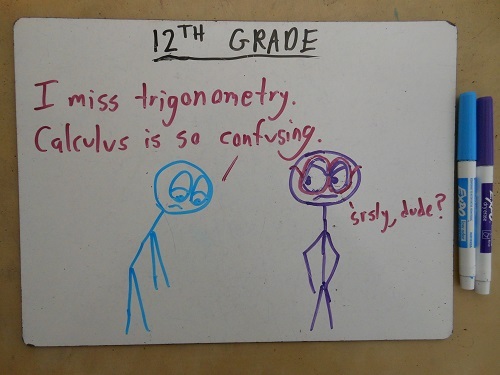 Math is fun to play with in class, but at 42 I can attest to not having really needed advanced math in my life to the extent that they made me sit through classes, and it sure hasn’t been necessary to make me pay thousands of dollars for it. Do I think math is irrelevant? No, not at all; did it make me a better thinker? Not terribly. But although I can see the greater importance of it, I really wish I’d had the choice to either not learn it, or take it when I’d found a proper teacher for each level–they weren’t a very kid friendly bunch–you either got it, or you were a retard banished I the back if the class and ignored. True story. So the point of this ramble, is that what I got in college when the switch finally clicked on and my brain understood numbers like it understands words, was a wonderful Eureka! moment and a love for things mathematical. I enjoy reading about it, and it helped me go from a D in astronomy to an A; but even more, I LIKE it. Perhaps if they gave us the basics as kids then hit us with the hard stuff later, like grown up later, we wouldn’t be so miserable? Yeah, I think you hit a lot of nails on their respective heads. I think there’s a good chance our curriculum is broken. 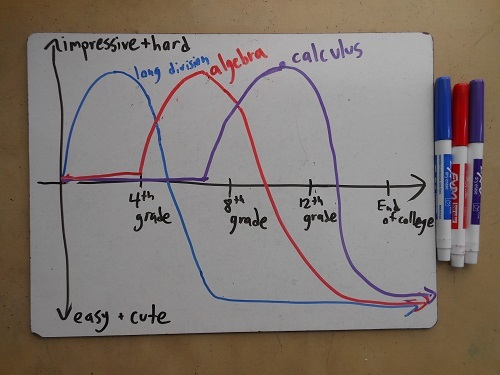 Most students emerge from 7th grade (the last year of math most of them will ever actually use) with a weak grasp of the basics, and then they spend the next five years layering on abstractions that only a fraction of them will ever benefit from (and, for that matter, understand). 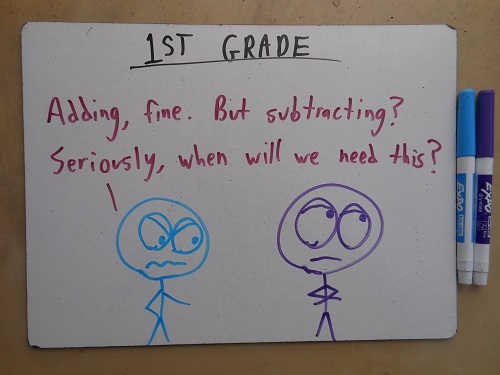 I’m not sure if the solution is a new standard curriculum, or new pedagogy, or more curricular choices, or some mixture, but it seems that some reform is probably in order. 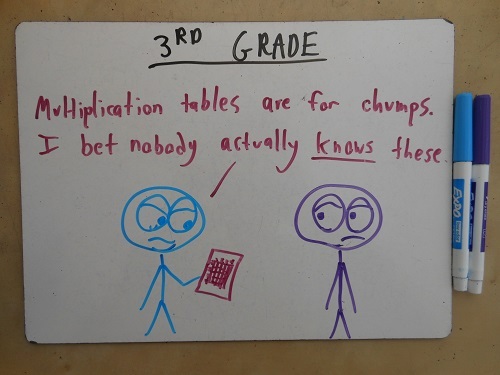 Where is the third grade one? 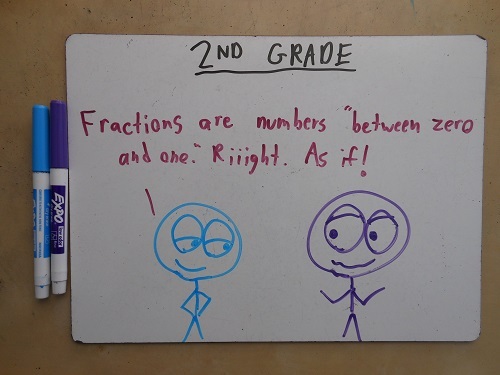 Something to do with multiplication. Yeah, forgot to upload that one somehow! Now restored to its proper place. Despite not having a PhD (still in 9th grade) I can relate to the last one. I often find myself using a calculator for small things like these! 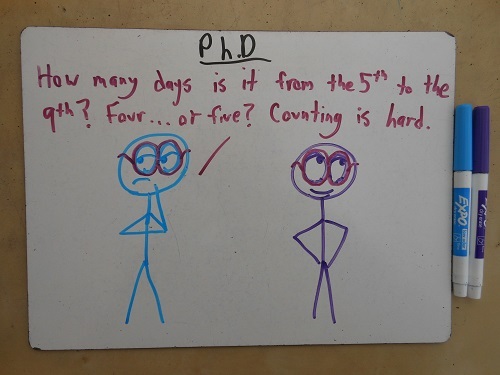 Well, now you can tell your friends you’re doing PhD-level math! 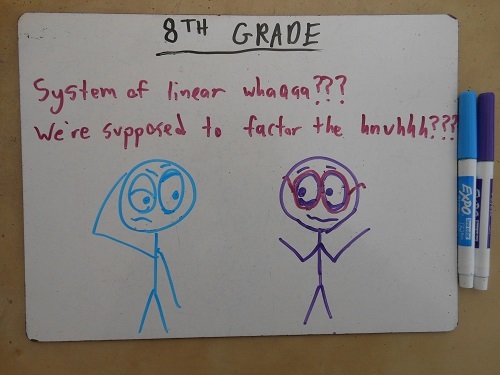 Can I print these photos to hang in our math hallway at school? 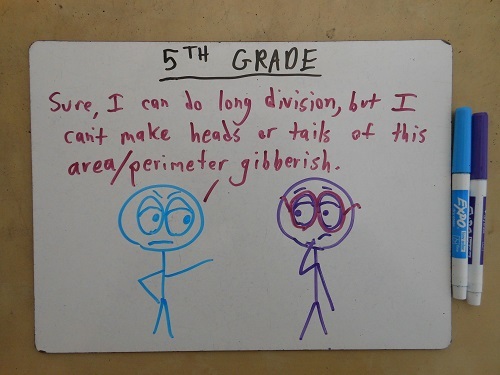 We post all kinds of fun math pictures we find on the internet, and I think the students would get a kick out of this! Would you be willing/able to send me the files so I can get a good resolution, or would saving from the site give me a good enough resolution to print on an A4 paper? These photos are 500 x 375 pixels. I have bigger versions, too – if you email me (just my name at gmail) I could send you the originals. I noticed you’ve stopped the alt-texts. Yeah, WordPress changed the interface and made them harder to create. A commenter kindly explained to me how to do them, but I’ve been too lazy to implement it. If I get enough complaints I’ll probably buckle down and figure it out. This post is heartening. 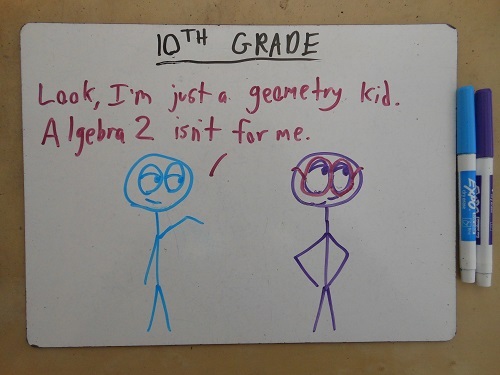 I can’t say I loved math when I was a teenager, but for some time now I’ve been teaching myself stuff that my teachers tried to teach me (or failed to teach me) in school. And now I’m thinking: math is something I can fall in love with. 🙂 Cool drawings, BTW.